It's happening again: one of your current clients knocks at your door (or inbox) with a new project for your agency. Yeah, time to celebrate! But then, right before breaking the news to your team members, you realize you don't have resources. The client is asking for a very specific task and you don't have that specialty among your in-house resources. What do you do now? You don't want to miss this job opportunity, of course. 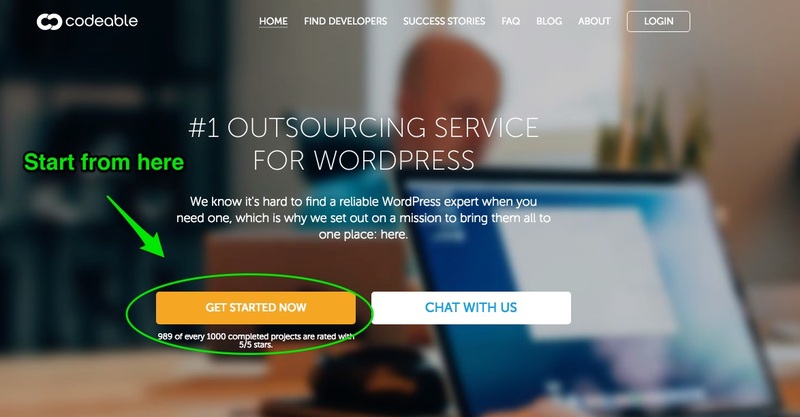 But this means you'd need to find a trusted WordPress specialist, ask them how much they'll charge you, add your markup eventually, and then get back to your client with a proposal. How come I can get an estimate for my client's request without hiring the developer? Is it even possible? While many might assume this to be difficult or even impossible for some reason, the truth is quite the opposite! Let's see how you can get an estimate for client work without hiring a developer on Codeable. Ok, so you already have a good project brief (did you check for red flags?) in your hand and need help understanding how much that would cost so that you can let your client know. Given that the project requests are mainly defined, you should start gathering information related to your client's budget. Talking about a budget is never the easiest part of a project, but it's an important aspect that should be somewhat defined right from the beginning. If you could inquire your client by asking them something along the line of: "What's your budget for this project? Is it above or below $X? ", that would make it a good conversation starter and it'll keep the conversation focused on what's important for you to know at this stage. Your client's current budget is an important element that allows you to get a better-informed quote from developers. If you don't have a budget yet, do this. An effective way to talk with your clients about budgeting for their projects is linking these to KPIs and/or features that would need to be deployed. For example, a project that costs $1,000 and is expected to bring in $5,000/$10,000 in the next 6 months sounds more appealing than one that might cost $500 but brings in only $300/$400 in the same amount of time. The return on investment and the budget that a client might want to allocate to their project are influenced by the respective costs with regards to the time taken for it to generate returns. When talking with clients, I like to bind the value their project brings in to a timeline, for example within the next 12 months. This approach helps clients with their thinking. A simple question like 'How much money will this feature bring you during the next 12 months?' should clarify the situation. It is important to have this discussion with your client because it allows them to tell you what kind of money they're willing to spend depending on the returns that the particular feature will generate. When the project is big, i.e. it costs $5,000 and up, you might want considering breaking it into smaller milestones and ask the client about the budget for each. As noted before, trying to pair the budget with the ROI and feature gives the right context in which this discussion should occur. It is important to have this discussion with your client because it allows them to share with how much money they'd be willing to spend in relation to what such particular feature will generate. Splitting a bigger project into milestones and discussing them with your client allows you to manage expectations properly on one hand, while providing a more efficient flow to the development work on the other. To recap a bit: you're in need of a trusted WordPress developer or specialist of any sort because you have client work you can't take care of, either completely or just part of it. You need to get back to your client with an offer but don't know how much it'll cost you to hire a freelancer for that job. That's where everything you should have already done and prepared (what we covered earlier) comes into play. So here's the cool thing: if you need to get an estimate from developers at Codeable, the best way is to post a project. Posting a project is free (note: posting is free, the project delivery is not) and when you do, you can count on a no-obligation to hire policy. This is the key factor here you should pay attention to. Posting a project that outlines your client's request is free for you to do. But, you need to be upfront and open on the purpose of your request: you're looking for a ballpark estimate that will then need to be approved by your client. Would developers start engaging to such project with no immediate hiring involved? There are plenty of developers who understand your request is for client work. Usually, developers who are more inclined to serve agency clients are those who will start engaging with you. We understand you need to get an approval for your quote. As long as your brief is good enough and what you need to be done is clear, there will be plenty of people willing to give you a ballpark estimate. We know we'll get hired if the estimate is approved. Don't try to exploit the platform, though: you have to be straightforward about your inquiry for ballpark figures and not actively hiring anyone at that moment. This trait will decree what would come next: developers engaging with you to deliver you an estimate vs an unanswered request. So how can you get a precise estimate, then? Write a few sentences about the end results that your client is trying to achieve at the beginning of the project brief and briefly share what the business is all about. This way you'll provide your prospect developers with an informed context. Then, add the project requirements as you'd normally do. Getting an estimate all comes down to enriching your request with as much information as you can. The more details you share, the more precise the estimate will be. In case you're unclear about any of the technical details related to your client's project, you aren't doomed because you have the chance to jump on a 1-to-1 a consultation call that will likely clear doubts for you. There are many benefits from a consultation task – how it's called at Codeable. One of which is that you get a much simpler and clearer picture on the project details so that, at the end of the day, you can handle it much more effectively. When it comes to obtaining estimates for client work, the most effective way to get them is to engage directly with the freelance developers and/or specialists who have the right expertise for what you need to deliver. This makes it easy for you to manage the project because you have an estimated price from the outsourced developer/specialist which, if approved, will allow you to get started on the project in a shorter time with a budget already been established. On top of that, it'll free you from regularly explaining how the project is evolving as your client is aware already of "the big" picture. As a business, your revenue stream is not only linked to how much work you deliver. It has also directly impacted by whether your client perceives the same value in your work that justifies how much you charge them for. If there's a misalignment here, your client won't be happy and they'd feel ripped off. Leveraging the approach here outlined sets you and your business on a solid path towards properly managing your client's expectations. And, as you've already realized, their money. Hello guys and girls. Please give me the honest feedback about the website and any suggestions of what could be done to make it better. http://under-the-open-sky.com Can you please review my website and tell me what you think. Thank you for sharing such amazing content that give the basic idea of virtual assistant services and its benefits.